Hoot hoot! The owls are stoked that they’ve been a hoot. 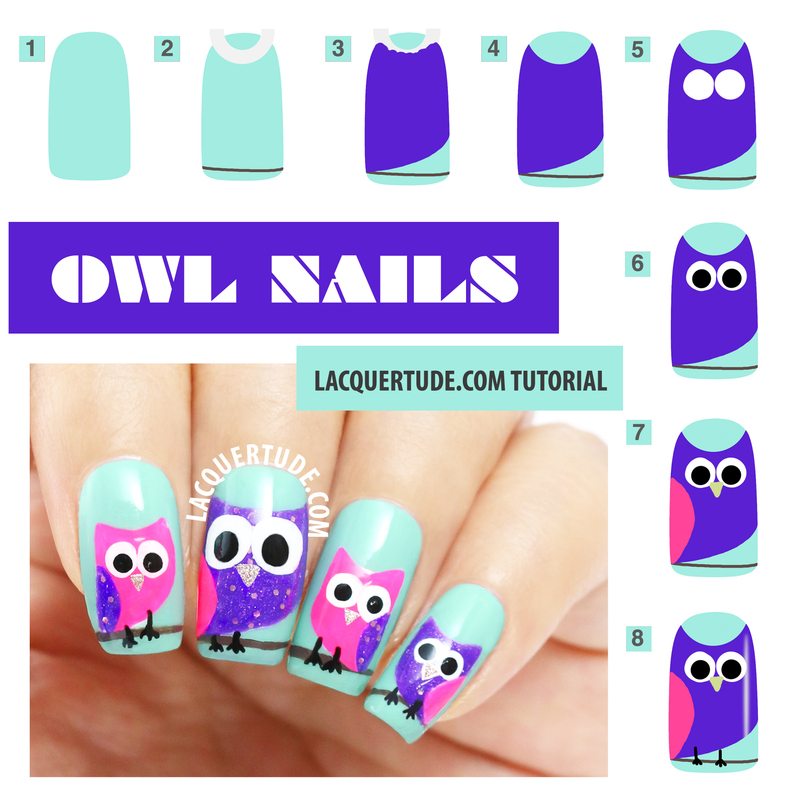 After popular demand, here is the tutorial for yesterday’s owl family nail art. 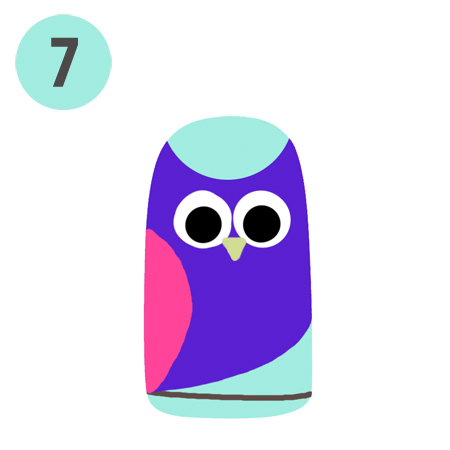 There are many other owl tutorials out there, but this is my original design showing exactly how I created it. It’s actually really simple to do. First, here are the supplies you’ll need. 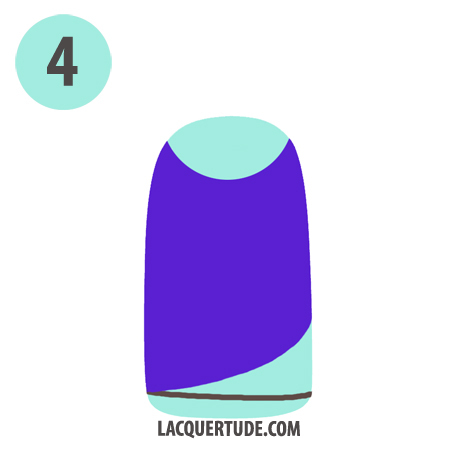 Δ Polishes are all colors by piCture pOlish: Hot Lips (pink), Tiffany (turquoise blue), Imperial (purple with glitter). Previously swatched here. Δ Nail Art brush is super handy, I use the end tip as my dotting tool and you can also use the brush to refine your edges if you feel up to it. TIP: if you use them with polishes, then don’t invest in anything that cost too much because the chemicals will destroy them. My link takes you to Amazon, where you can get a whole set for just a few dollars. Δ Base coat is a must. I’m using Nail Tek Foundation II. Δ Topcoat here is HK Girl Glisten & Glow, the best I’ve found after testing at least 10 other bottles. There’s no color transfer regardless of how pigmented the colors are underneath, and it does not streak even with black acrylic! Δ Regular binder reinforcement stickers. TIP: I cut them in half because my nail bed is so curved. 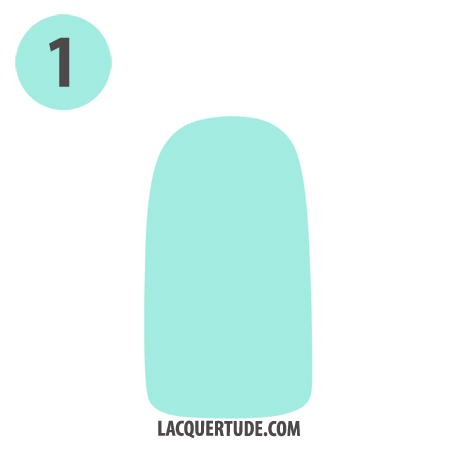 This way, it’s easier to adhere it neatly around the cuticle. 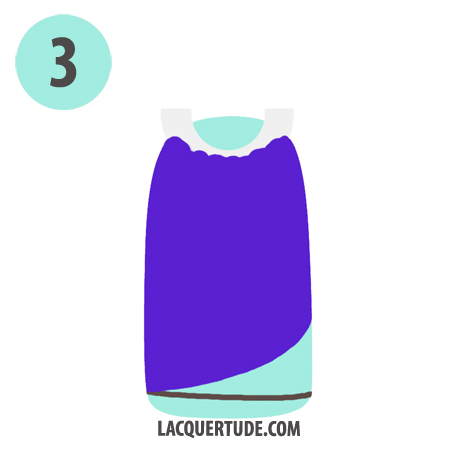 Δ Small glass container to hold your acetone. 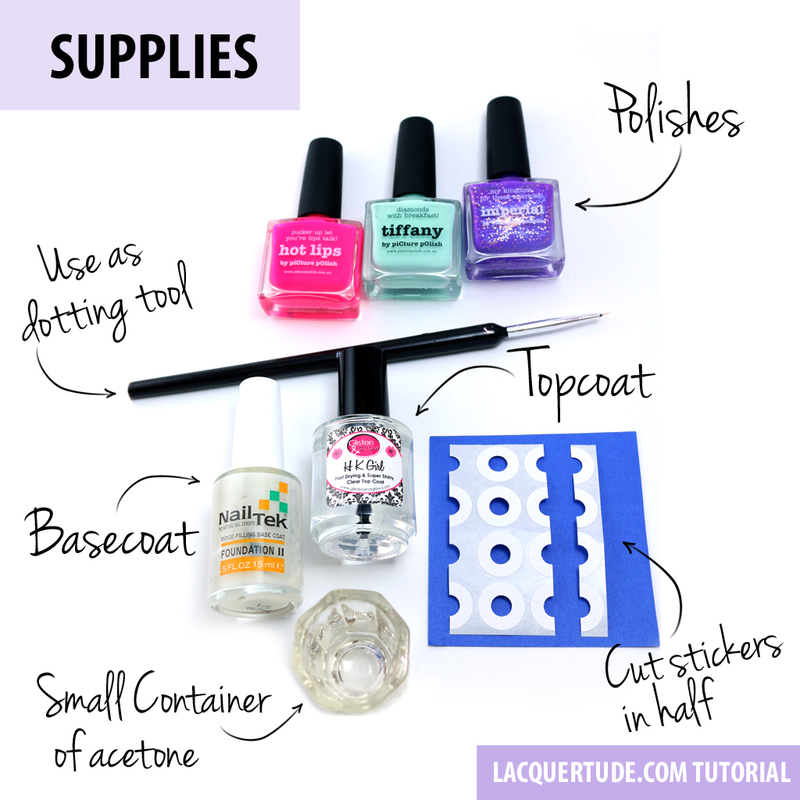 TIP: I find that using a small glass prevents the acetone from evaporating as quickly as with plastic. Δ Not pictured here (sorry ladies & gents, I’m still new at this, but I’ll get better. Hoot!) are piCture pOlish Metallic Mush (swatched here and another nail art & tutorial) for the beak, Malt Teaser (swatched here also with another nail art & tutorial) for the branch. Regular black and white polish (acrylic will also work well). Paint 2 coats of Tiffany and let dry (or apply a thin layer of quick dry topcoat). Using a small nail art brush, paint a branch using Malt Teaser. It doesn’t have to be perfect. If your hand shakes a bit, no worries, because it’ll create the natural bumps of the branch. Then place half of a binder enforcer sticker at your half moon, take care to really press firmly around the cuticles to prevent lifting. Paint 1 (or 2 depending on your application) coat of Imperial, starting from the sticker, sweep straight down the left side of your nail bed, stopping just above the tree branch. Then make another sweep filling in the right side of the name, curve it at around 3 quarter of the way down to make the side owl belly shape. Quickly remove the sticker and your owl body’s complete! Using the end of the brush or a dotting tool, create the eye whites. If your tool is not big enough for the size of eyes you want, simply swirl it around until your dot is big enough. TIP: don’t be afraid to dip your tool with polish more than once to get the shape you want. Using the same tool (or a smaller dotting tool), create the black centers. Using the nail art brush, paint a beak with Metallic Mush. Then paint the side wing with Hot Lips. 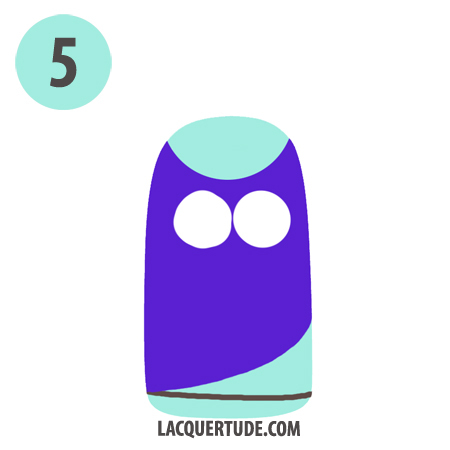 Draw the little owl feet with black polish or acrylic. Then, topcoat with HK Girl Glisten & Glow for ultimate smooth glossy finish that protects your hard work! Voila! You can repeat on all your nails and you’ll end up with your very own owl family! Hope you enjoyed this tutorial. Questions? Leave me a comment below and I will answer them! If you recreate this look, I would love to see your hard work. Share your photo by following my Instagram account, hashtagging #lacquertude, or posting it on my Facebook wall. Holy! This is awesome! Honestly, this is the best tutorial that I have seen and you illustrated it so beautifully! Love the owls!